Over the years we have seen fads come and go and trends ebb and flow as business requirements and drives change. DevOps has however been rather resilient so much so that all of the enterprises believe they now need it, the interesting point here is that they still don’t know why, they just know everyone else has it and if they don’t their behind the times. There’s an increasing trend to have the DevOps teams literally sit between Dev and Ops, companies doing this should stop. Here’s a couple of thing not to do and examples. What both of these enterprises have done is jump on a band wagon and some how understood DevOps to be the thing that makes deliveries smoother and therefore sit them between the dev and the ops, mainly as they have an existing Dev team that works and an existing Ops team that works but they don’t have a DevOps team. Lets examine this, Dev one side Ops the other. 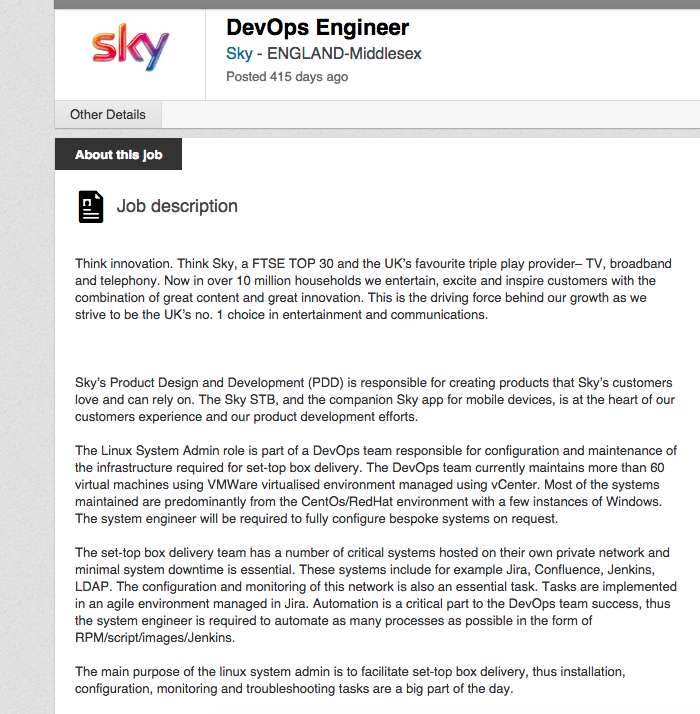 DevOps is meant to, and I’ll spell this out simply for Sky and Defra…. 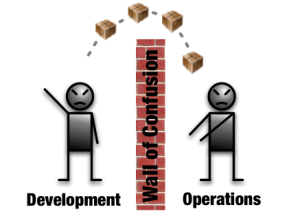 break down the wall of confusion. Not as these guys have done which is to implement DevOps between a Dev Team and an Ops team to help make it more agile. Then there’s the people that think simply by making Developers do operations they get DevOps, Infrastructure as code they say, yay. I’m not saying developers can not learn operations, likewise this rant applies to ops doing dev… anyway the point is forcing one skil set to do the other is hard. Firstly realise there is no right answer. Secondly realise experimenting and trying new things is necessary. Start with a good foundation. Get a Senior Dev and a Senior DevOps guy in the team, for the DevOps guy I consider these the 3 most important things. The hard thing for anyone going from Dev to Ops or Ops to Dev is that they have a massive learning curve, and they may not realise what it is until many screw ups have happened but having these people in the team is massively important because they will bridge the gap between the Dev and the DevOps and trust me there is one. Once you get these 3 or 4 people in a team the next most important thing to do is to make that team fully accountable and responsible for the end to end service. If anyone in the team is not okay with supporting the service they wrote and designed in production, fire them and find someone new. it’s paramount to have the buy in within the team of accountability of the product and services in production, it forms a fundamental pillar of continuous feedback. I did something bad, it bit me / my team, they told me I did it bad / I noticed I did something bad, I made it better, we all benefited. By having the right people working in a close nit group and empowering them to own the whole solution front to back is the only way you can realistically implement DevOps and have meaningful gains. I know what you mean. I’ve worked in an organisation where the top management wanted to start doing DevOps, but didn’t really know what it meant. Just a buzzword to add to the list of stuff they do.